These are noisy and gregarious birds with often beautiful striking songs. nests and incubated by the female. South Wales, Mauritius and Florida. but the vent area is red. the eye, but is not always easy to see. bushes or on power lines. 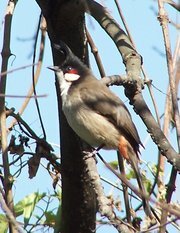 The Red-whiskered Bulbul is about 7 inches in length. but will perch conspicuously on occasions. It builds its nest in a bush; two to three eggs is a typical clutch. Flight is bouncing and woodpecker-like. These birds feed on fruit, nectar and insects.